I would like to introduce you to our new son, Callan Gregory Frost. He was born on March 12th at 8:13am and he came into this world in a much less stressful way than Elena. 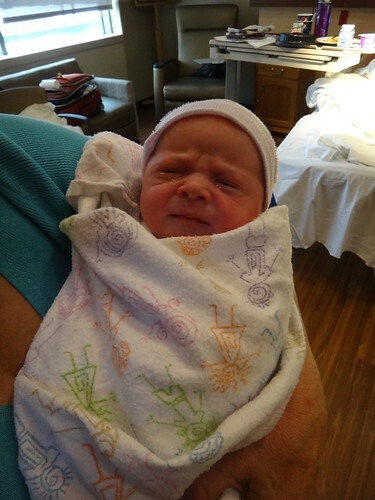 He weighted in at 7 lbs 4 oz and is 20 1/2″ long. Both mom and baby are doing very well and we where able to come home yesterday. Gillian went full term and did not have any complication, no pre-eclampsia this time! Callan was actually born on his due date, something that only happens about 2% of the time, so says my mother-in-law. Gillian also did not need to have a c-section, which we have discovered is a much better way to do things. Elena is ecstatic! Her baby Callan is finally here and not in Mommy’s belly anymore. She has already started talking for him and bring him toys that are far to large for him. She has been very sweet to him, I can only hope it stays that way … at least for the first year…six months?…ok, if she can go 3 months without demanding Callan goes back into Mommy’s tummy, I will call it a win. I did purchase CallanFrost.com and avid readers of this thing may have noticed the “Callan” link in my Friends column. His website is up and running, so feel free to visit for all things Callan…Elena might be in there a little as well, I doubt I will be able to take many pictures of him without her. Pictures, like always, will be up on flickr as well. So far he has been sleeping fairly well, so Gillian and I are not complete walking dead, of course it has only been two nights. The little blonde opinionated two and half year old still wins the most frustrating child of the house award, Callan has a lot to training before he can even think about taking a run at that crown. The strangest thing for me is that it is not just Elena anymore, I can now say I am a father of two… weird. Also, since Elena was really my only experience with babies I associate “baby” with “baby girl” so I find myself looking at the bright pink whatever in a store and I have to stop myself and say “wait, he is boy”. Not that I would really care if my boy wears pink, I just don’t want to force it on him. Oh and everyone asks about the name so here you go; Callan is just a name for a baby book, we liked it, that is it. Gregory was my Dad’s name, it was actually his middle name but he always went by Greg instead of his given name of James, this caused a lot of confusion with people in his life, and death for that matter. I thought it would be a great way to honor my father and give my son a little story to go with his middle name. Alright, I have finished a post, something I haven’t done in a while, everyone is asleep so I should really stop typing and join them…I have a feeling I am going to need it. This entry was posted on March 15, 2013 at 4:04 am and is filed under Baby, Callan, News, Parenting. You can follow any responses to this entry through the RSS 2.0 feed. You can leave a response, or trackback from your own site.